The Ubie is light, fast efficient and portable. It's simply the best. How the Ubie works: The Ubie operates easily. Warm air above the flame (which is CO2 and H2O) is drawn through the tip and through the tobacco. The flow of warmth through the diffusion tip automatically prevents burning. 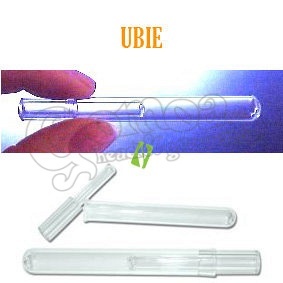 How to operate the Ubie: Place a tiny amount of finely chopped tobacco or herbal inside. Replace the mouthpiece. Hold the tube vertically and tap the tube gently to gather the tobacco toward the mouthpeice. Hold a standard butane lighter flame about 2 cm below the tip when drawing flavor. After the tobacco becomes exhausted it is easily tapped (with fingernail) to fall out of the cylinder while still warm.